babyganics Color Changing Swim Diapers : Okay, so these might not be the first thing you think of when you hear “fun in the sun” but if you’ve got a little one in diapers and plan to visit any sort of body of water (especially public pools), then these are a necessity. This new swim diaper from babyganics, a favorite brand with weeSpring parents, are made with sustainable core material that won’t swell or sag in the water and provide awesome UPF 50+ coverage. They also feature a special color changing technology that interacts with UV exposure–the frog on the front changes color as your baby plays outside, reminding you to reapply sunscreen or find some shade for a break from the sun. Summer Infant Pop ‘n Play Portable Playard: Keeping your tot occupied while out at the park or beach can sometimes be trickier than you think, especially if you’ve got an adventurer who likes to put everything (grass, sand, wood chips) in their mouth every 6.7 seconds. Enter, the Pop ‘n Play. 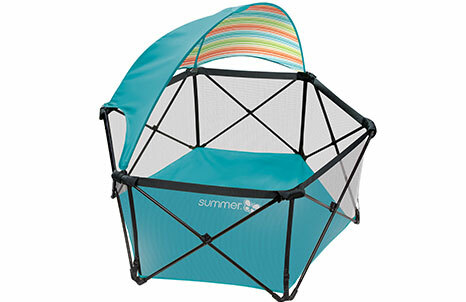 This super portable and light-weight play yard provides an ample, safe play space, that can be set up in seconds. It also makes a baby-proofing while on vacation a breeze, so be sure to pack it on your travels this summer. (Want to see it in action? Check out our video review of it here.) And now, for 2016, they’ve added a full canopy accessory to provide even more shade coverage for your little ones. 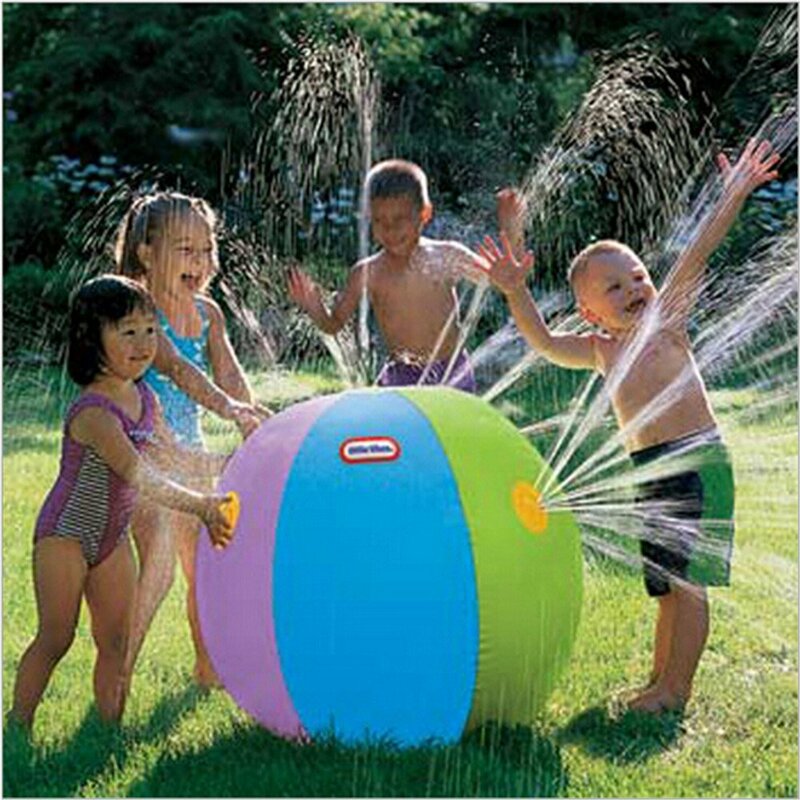 Little Tikes Beach Ball Sprinkler: Sometimes it’s too hot to even think about heading to the neighborhood park or the pool. This award-winning backyard toy (a Parents’ Choice award from the Parents’ Choice Foundation) will bring hours of entertainment for kids of all ages. Simply inflate the 88″ diameter beach ball and attach your hose to let the fun begin. Once summer’s over, it deflates and stores easily and can be used for years to come (without taking up oodles of space in your garage, basement or storage shed). Buglet Bug Repellant Slap Bracelet: Buglet helps you and your kiddos say buh-bye to bug bites, without the chemicals. This one-size-fits-all bracelet uses 100% natural essential oils to deter those pesky nibblers from getting in the way of a good outdoor play session. The bracelet has a pumice stone head that absorbs oil and consistently releases the scent (the oils are totally safe if they come in contact with the skin, even though they’re meant to stay on the stone). Recommended for kids ages three and up, these can be worn on wrists and ankles all summer long. 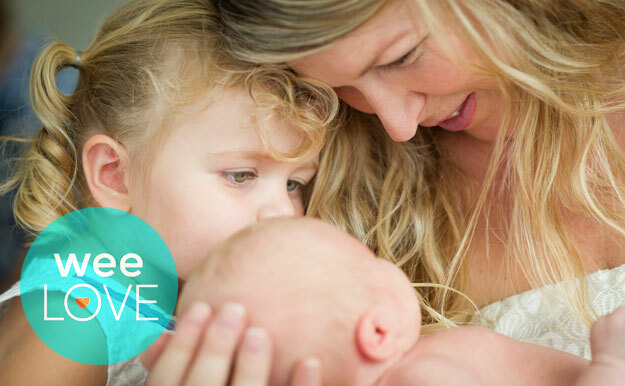 Read why weeLove them here. 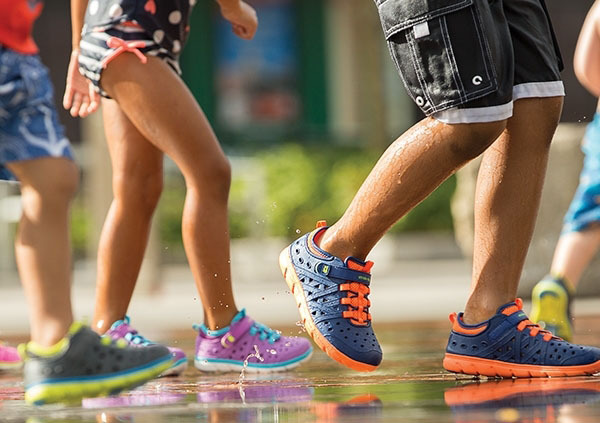 Stride Rite Phibian Sneaker Sandal: Tiny toes need protection in the summertime, but with splash pads and sandboxes, you’ll want a pair that’s also water-friendly and easy to clean. The Phibian (as in “amphibian”) will be your go-to versatile sneaker-sandal, allowing your tot to go from “sand to sea, lawn to lake, sidewalk to sprinkler, and everywhere in between.” They have a slip-resistant sole, are super breathable and can be hosed off or tossed in the washing machine for a deeper clean. Plus, as a part of the Stride Rite family, they’re specifically designed to meet the needs of growing children and are available in little kid and big(ger) kid sizes. 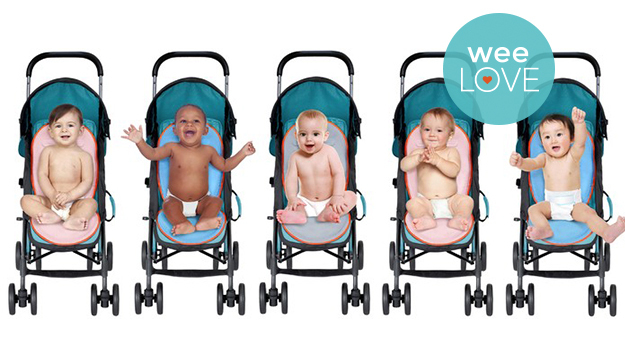 Geleeo Cooling Stroller Liner: Hot summer trips to the zoo or the park can quickly lead to overheated, cranky, get-me-out-of-this-stroller toddler meltdowns. Created by a mom who couldn’t bear to see her babe battling the summer heat, this cool stroller pad (no pun intended) features a safe, water-based cooling gel that keeps your kiddo comfy by absorbing and releasing heat. No refrigeration necessary (and it’s super easy to clean). Just grab and go. It’s non-toxic, breathable and waterproof–if only they came in adult sizes, too! (Please note that these are not to be used in car seats!) Read why they’re one of our summer favorites here.